Here is proof of the wisdom of the masses. We have lived here 15 years and in the thousands of times I have always stated that we live in the Blue Ridge. No one has ever set me straight until in last Saturday’s message a reader explain that this are is called the Stone Mountains. When trying to farm, I can see why they call it Stone Mountain! some huge stone formations on the farm. That’s me in the orange. Stone Mountain State Park (NC) near our farm. Yet this is why we also have to filter the knowledge of the masses. 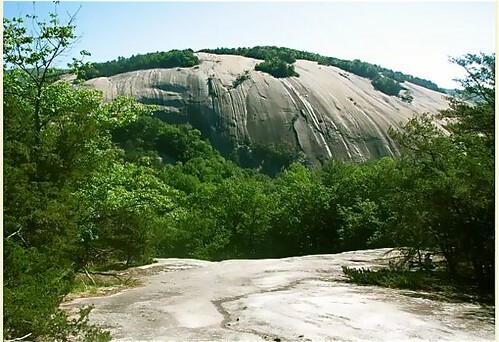 Wikepedia says: Stone Mountain is the centerpiece of Stone Mountain State Park. 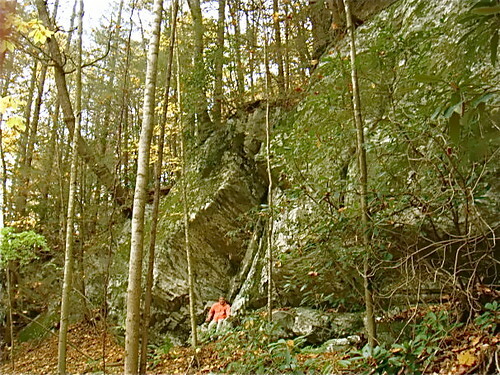 It is a dome of exposed granite (specifically a quartz diorite to granodiorite) of Devonian age, which has intruded into the gneiss of the Precambrian Alligator Back Formation. It rises sharply over 600 feet (183 m) above the surrounding terrain. The mountain, which has an elevation of 2,305 feet (706 m) above sea level, is known for its barren sides and distinctive brown-gray color, and can be seen for miles. 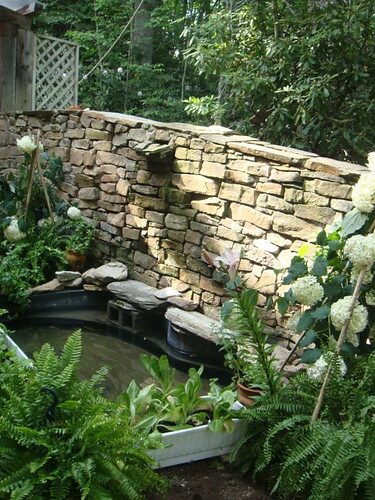 The mountain offers some of the best rock climbing in North Carolina, and the park’s creeks and streams feature excellent brook trout fishing. Because the mountain is the best example of a monadnock in massive granite in North Carolina it was designated a National Natural Landmark in May 1974. Then Wikepedia goes on to say that the Stone Mountains ARE in the Blue Ridge Mountains range. So perhaps we live in the Stone Mountains and Blue Ridge? I was finally able to devote a full day to catching up on emails and had a few comments to add re security in Guayaquil. We first visited in 2002, when it was probably the worst of the worst. By 2008, a major transformation: The Malecon was gorgeous, and heavily patrolled by police or private security at all hours. Also a pretty international crowd cycling, doing Tai Chi, etc. was there. Fast forwarding to 2010, per my Ecuadorian friends, very chancy especially for unaccompanied people at night and often by day. Thefts of personal electronics are minor, though at knife or gunpoint, and everyone buys the cheapest possible cell phones and don’t carry cameras or Ipods in public. Of greater concern I the “express kidnapping”, a group effort requiring at least one vehicle: The mark is either grabbed on the street or takes what he/she thinks is a legitimate taxi. Once inside the vehicle, the victim’s credit card is taken and he/she forced to disclose their bank password. Then the vehicle drives from bank to bank or ATM to ATM while the thief withdraws as much as the card(s) will allow. Then the victim is released. So far, no casualties or at least none reported. Tourists are of course the easiest target, but citizens being more plentiful, these get trapped more frequently. So your advice never to hire a tax or guide on your own is critical to avoiding crimes of opportunity. And this goes double with taxis from any airport, bus, etc. My Comment: Many have commented to me that when Guayaquil cracked down on crime, many of the thieves moved to other cities in Ecuador. I suspect when New York cracked down on crime a lot of it moved elsewhere too. Take care wherever you travel. There is crime everywhere. Earning in Ecuador. My comment: A recent article at this site on Food Risk looked at the problem of chemicals and pesticides on our fruits and vegetables. The article reviewed how washing fruit and veggies with Purely Green or Bio Wash (similar products produced from the same bio degradable cleaner), showed how this could remove toxicity and improve the food’s longevity. 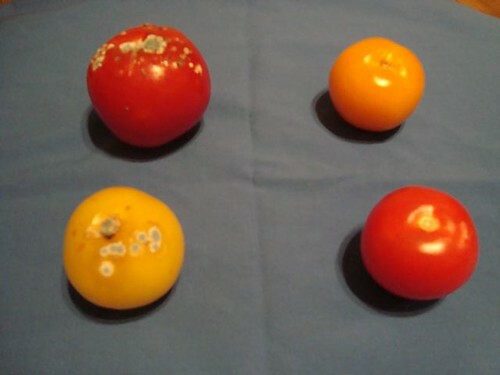 Ted, I wanted to show you the results of a test I did with tomatoes. I bought 4 tomatoes nineteen days ago. I used Biowash Heavy strength to wash the pesticides off two of them. The pool under the tomatoes was yellow with pesticides. I then sprayed the same two with the plant wash and left it on. After nineteen days those tomatoes looked almost the same as when I bought them. The other two got pretty moldy, as the attached pictures show. Ted’s Reply: “Thanks for the photos and description. Your report is valuable for growers, retailers and consumers. In appreciation, we are sending a free bottle of of PurelyGreen Oil Clean. Ted recently announced that an Ecuadorian farmer has now imported a large supply of Bio Wash to Ecuador so it is available in Ecuador now. Reader Question about Banking in Ecuador or Not: Dear Gary, As an avid Canadian reader of your news letter I am curious about your take on the article below. Is there any merit to it? As someone who is trying to position himself to escape this cold country permanently and relocate to Ecuador or Costa Rica (undecided at this point) it certainly is important to have an effective and solid financial institution for the safe keeping and reliable banking of my limited and hard earned funds. I certainly could not afford to lose any of it. Thank you for the great news letters….keep up the good work. A reply came from Oscar Lindblad of Jyske. I am answering on behalf of Gary Scott’s forwarded email to René Mathys at Jyske Bank Private Banking. Under reference to your email informing us that IceNews, among others, has published an article, ‘poor investment advice acknowledgement by Jyske Bank’, we inform you that the article is in our view too sweeping and does not reflect the realities of the case. In the autumn of 2007, Hedgeforeningen Jyske Invest launched a bond hedge fund, Jyske Invest Hedge Markedsneutral – Obligationer, which implemented a market-neutral investment strategy using a combination of Danish mortgage bonds and German government bonds. Many Jyske Bank customers bought units in the hedge fund, which was, we regret to say, hit hard by the global financial crisis in the autumn of 2008. Jyske Bank has received complaints from customers, and the investment product has been mentioned in a few Danish media. The Danish Financial Supervisory Authority issued a reprimand to Jyske Invest on the grounds that the brochure about Jyske Invest Hedge Markedsneutral – Obligationer did not offer a balanced description of the product characteristics and the risks involved. Also Jyske Bank was reprimanded – for not in a general way having taken steps to improve the sales brochure. Neither Jyske Invest nor Jyske Bank concurs with the criticism. The sales brochure for the product expressly mentioned the risk of the hedge fund going bankrupt, which must be termed the worst-possible scenario. The Chairman of Jyske Bank stated at the Bank’s annual general meeting in March 2010 that Jyske Bank does not dispute that errors may actually in certain cases have occurred in connection with the advisory service provided with regard to Jyske Invest Hedge Markedsneutral – Obligationer, but Jyske Bank does dispute that errors should have been committed in general in its advisory service. In June 2010, an independent complaints board, the Financial Services Complaints Board, found against Jyske Bank in five cases. In its decisions, the Complaints Board deviated from the usual practice and held that the burden lay with Jyske Bank of proving that it had provided adequate advisory service to the customers in question. Until the autumn of 2009 it was up to the com¬plainant to prove that the advisory service received had been inadequate. Jyske Bank has maintained throughout that only case-by-case scrutiny will reveal whether the Bank’s advisers have committed actionable errors in their advisory service. The cases with relation to Jyske Invest Hedge Markedsneutral – Obligationer reflect discrete occurrences, and the customers in question acted on the basis of widely different circumstances. Moreover, we have repeatedly declared that if we have demon-strably committed actionable errors in our advisory service in individual cases, we shall acknowledge liability. Against that background we decided, after consideration of each of the five individual cases mentioned above, to comply with the decision of the Danish Financial Services Complaints Board. With some other decisions of the Complaints Board we do not intend to comply. My Comment: Expect increased Chinese buying of US companies and real estate. Another reader wrote: Hi Gary, I just wanted to comment that your articles are just perfect for those “with” as it seems apparent that “they ” are the ones to benefit. Those of us that retire on a company pension and government pensions who thought we would get by just fine on an income of around 6-7 grand a month now have to wonder if there will be anything left for us to do to stay afloat barring some streak of fortune? where everybody or many will sell property for nothing down and then the question remains. Will there be renters to occupy such investments. Warily its seems that I have to succeed that things are as they always were that the rich and famous are the only ones that benefit. My reply You are so correct. I review the fact in my report “Running Risk – How to Profit in Risky Times” that the two biggest losers in these risky times will be pensioners and lenders to the US. Really enjoy your, “take,” on so many topics. With respect to one, re: Florida real estate investment opportunities – – the Coasts. as foreclosed units have lessened the flow of HOA fees. In addition, law suits by existing owners in big complexes are taking a toll on reserves as well. Investors do not need to flee the market in Florida, just be super careful and do their homework. There are some very good buys, but given the current environment, one has to be very careful. For what it’s worth, I live in Florida and know the economic and demographic environment reasonably well – – for what it’s worth. LOL! with that! Do have a crusty old Ph.D hidden away somewhere that had a little value back during my working years. My comments: I agree. I already self insure in florida. The rates on our property were so high it made no sense and we are mid state not on the coast. However we have a pool without a fence and huge oak tree growing in the middle of the house that really puts insurers off. Having said that our farm here in North Carolina with six cabins and a seminar hall throws the insurers in a tizzy as well so we also self insure here. The key is if you vary from the cookie cutter standard anywhere… insuring may be tough. Insurance and taxes are tow reason why in the Trading Down scenario Ecuador will do well.